On one of this blog's most popular old posts, A Rock, a Hard Place, and Some Complaints about Each, we recently got a comment from someone who worked at the Filofax Head Office when the organizers were still lovingly handmade in England. The writer tells us eloquently what it was like to work for the company in those years, including visits from Grace Scurr, the woman who recreated the company's information from her personal Filofax when the original headquarters was bombed in 1940. I urge all of you to light the fireplace, pour a snifter of brandy, and take a look at the post, which has a rich, lively comment thread as well as this exciting new addition. For further reading pleasure, here's a New York Times article from Filofax's American heyday in the late 1980's when celebrities like Woody Allen and Diane Keaton were seen carrying their organizers everywhere. When you click a new window opens listing everything that comes in the pack, plus an offer to get $10 off and free shipping on an A5 organizer. Presumably, the offer targets mothers who want the Family Pack but don't already have an A5 binder. And the contents of the pack are yummy: Pages for school and sports info, shopping lists, emergency info, travel and party planning, budgeting, and (my favorite), a chore organizer! It also includes a 2009 week-per-2-pages calendar that has slots for different family members. I can imagine you don't need to have a family to find this pack useful. Time to talk about new organizers and formats for 2009, or anything else that comes to mind! A lot of people have been asking how I'm going to use this new organizer. Yes, I'm going to use it as my personal Filo in 2009. (The Daily Planner gave me both 2008 and 2009 diary refills.) I'm going to leave my current red Finsbury as is, and just copy any necessary information into the new Finchley. Well, except the phone number pages. Those, I'll probably just stick right into the new book. I'm not doing a good job using my current tabs (To Do, Projects, Ideas, Lists, and Tel), so I'm not going to use the same set up in the Finchley. I'm going to stick with the built-in tabs and see what needs come up. So I guess I'm using the Finchley as an opportunity to make a clean break. The red Finsbury will be all set to go when I'm ready to go back to it. I may do so for the summer, when I prefer brighter colors to brown. For now, I think we're going to get along just fine. Don't worry, I'll soon post about my new Chocolate Finchley, of which I'm in awe. I've already taken pictures of it! Not much happening in my Filofax life these days, but there's been some talk about maps lately, so I thought I'd share a map I bought from The Daily Planner earlier this year. [Aside: One reason there's not much going on is that I'm still waiting for the current Daily Planner order I placed a couple weeks ago. My two emails asking to track the package have gone unanswered. I have no 2009 calendars yet. Grrrr.] UPDATE: I just got the Daily Planner package...by FedEx! They must have felt bad about the delay and expedited it. Thank you for good service as always, Daily Planner! Anyway, I bought a Boston map, and got this. It's made of stiff, shiny paperboard. It's printed in Canada and updated as of 2005, although the outer packaging says "Made in U.S.A." Streetwise (www.streetwisemaps.com), which bills itself as "Originators of the laminated accordion-fold map," also makes larger maps that fold up the same way, without the Filofax holes. I wish they didn't waste so much map space on their logo. The reverse of the map has a street index and subway map. I've got some Thanksgiving and other holiday stuff to post, but in the spirit of keeping Fridays truly free for all, I'll let you readers take over. Wow, was I late posting this week! Courtesy of reader GG, here's an online 20% Off coupon from The Container Store. The store has some Filofax refills, as well as Miquelrius and other notebooks, files, filing boxes, and other organizing supplies. As the year is drawing to a close, I've begun to think about what I'm going to do next year in my Filofax, and how well what I'm doing now is working for me. Today I took out the 2008 pages (I've been using Kate Spade, Personal size), except for November and December, and put in my 2009 diary (week per 2-pages, cotton cream - delicious!). It's scary how thin the rest of this year is, in terms of paper! I'm reevaluating what I've been doing. This year, it's been a week-per-2-pages, followed by tabs marked To do, Projects, Ideas, Lists, and Tel. To do - It's been ages since I wrote in or looked at this section. I guess I've been so busy that I only have time for must-dos, which get written on the weekly pages, like paying bills, renewing licenses, and so on. Things like getting a new cell phone or getting my car detailed are just sitting there on aging paper. Projects - This once-active section, with one yellow lined page per project, has also become just bulky, unused paper. I've planned trips and special evenings in this section. Now it's just undone termite inspections and insurance reviews. Can I keep track of projects in a way that doesn't require as many leaves in my book? Ideas - A couple of years ago, I had so many ideas I could spend hours writing them down. Now? I guess I've finished writing down that backlog of ideas and don't have any new ones. Maybe I'm also too busy to speculate about things. But will I ever see Elton John in Las Vegas? Will I ever get kayaks for my husband and I? Who knows -- but do I really need to carry these dreams everywhere I go? Lists - The only page in this section that sees much action is my grocery shopping list. This section has various lists in alphabetical order (A5 paper sources, Bare Essentuals makeup I want to order, Beau Ties neckties to order for my father, books to read or to send to people, Christmas gift lists, etc.). I've been thinking lately, what might work better is one-day-per-page plus A-Z pages, not all these other tabs. But one-day-per-page doesn't come in cotton cream, which I love! One thing's for sure, a lot of what I'm currently carrying can be pulled out and stored away. When I reevaluate my system, I take some notebook pages and write "What" on the left side, and "Where" on the right side. This arrangement helps me figure out where I might put certain kinds of information. It helps clear my head. Then I build my Filofax system from the ground up. The other night, I did this in my Miquelrius A5 notebook, using pencil and drawing lines between the different subjects, as shown in the picture. This is only one out of 3 page spreads. I placed a Daily Planner order this weekend. They're having a sale, and I indulged in a personal Finchley with a chocolate cover and cotton cream filler inside!!! I also bought horizontal week-per-2-pages for my work and kitchen A5 Filos. With apologies to reader Vidya (I couldn't contact you directly), I'm pulling this comment to the front because of the urgency and danger of the topic: the recent wildfires in California. A new fire started last night in the San Fernando Valley, which isn't a forested area...it's an area where millions of people live. Not to post off-topic, but the timing seems appropriate. I live in the Central Coast of California and yesterday many of my colleagues were either evacuated or preparing to evacuate because of the wildfires. People were trying to figure out what they should take in a very short time. Earlier this year, I started a list in my Filofax of what I would want most in case I ever need to evacuate. My Filo is almost always with me, both at home and out, so I know it will be close at hand if/when the situation arises. I know that if I didn't have a list handy, I would stand in the middle of my house, in a panic, grabbing nonsensical items. It gave me a sense of peace knowing that I am prepared in one small way. In this part of the world, evacuation isn't a theory, it's an eventual likelihood. So far, friends and colleagues are all safe, although my beloved Mt. Calvary Monastery/Retreat House was burned to the ground. The Montecito fire seems to be contained, but now there is another fire, to the east, in Los Angeles County and I am hoping it gets contained quickly. We've got a request for today's topic! What do you write with in your Filofax? Pen? Fountain Pen? 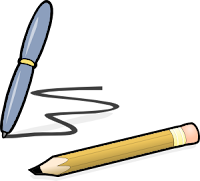 Pencil? P.S. Check out the comments on this post for some great pen/pencil carrying ideas. Why not cut your pen loop in half and carry 2 pens? I’m old-fashioned when it comes to keeping my calendar, and I carry around a worn, fat Filofax that contains every piece of information I need to live my life: my calendar, addresses and phone numbers, class lists for both girls, business cards for doctors, repairmen, etc., a list of important birthdays, a subway map of Manhattan, and a few precious mementos, like the Valentine heart the Big Girl made for me when she was in kindergarten. But it's worth clicking for the illustration alone. Since the Container Store no longer carries A5 Filofaxes, I decided to try my local Stationer/Gift Shop, which used to have a really good selection, before resorting to placing an online order. Sadly, I found they've also cut down their selection. They have no A5 organizers, and just a few refills; notably, the A5 vertical week-per-2-pages (which I don't want), month-per-2-pages, addresses, and to-dos. But I was able to get my Personal week-per-2-pages. I decided to get Cotton Cream for a change, since I also have some Cotton Cream to-dos. I think I'm going to like it! They also had Finchley organizers with complete Cotton Cream insides -- very luxurious! I think I'd like to go all-Cotton-Cream someday. - They still have the Kate Spade in both Personal and Pocket sizes for 2009. If you look back, you'll see I'm using Kate Spade for my 2008 diary, but I bought it during the year when it was marked down to $8. The full price for the Personal is $24 -- twice the price of even the Cotton Cream! - This particular store has just as many Mini organizers and refills as Pocket! The Minis are usually hard to find. - They have the small 6-ring Mead binders and filler paper. It's the same size as Personal Filofax, but thinner and cheaper. You can't get this size at the big chains like Staples anymore. Small shops like this one are more likely to have these specialty items, but they're more expensive. A Mead composition book is $4! - New this year, the store now stocks Moleskine diaries. They've spread from Barnes and Noble to college bookstores, now to little gift shops in the 'burbs! - Also new: Myndology notebooks and paper. These have the flat plastic rings like Levenger Circa. Another item I'm surprised to find in a plain old gift shop. - I also saw a Cross journal (made by the Cross pen company) with a leather cover and built-in Cross mini pen. Pretty cool! Gee, can you tell I love stationery stores? I've had a crazy week. What's new with y'all? In 1975, the late comedian George Carlin appeared on the Mike Douglas show. During his routine, he referred to notes that were placed on a low table in front of him, out of camera range. Notice how he's shot from mid-thigh up the whole time. Eventually, however, Carlin revealed to the audience that he was using notes and made it part of the act. At the very end, he actually picks up the sheets and shuffles through them. Look what kind of paper it is! Looks to me like 6-hole punched pages that would be at home in an organizer book! I've written about Daylight Saving Time (European Summer Time) in the past, usually with a photo of the notation on the Filofax diary page. Tonight, I wasn't able to get a clear photo, but my Filo for Sunday, November 2 says "Daylight Saving Time ends, Canada & USA*," with the parenthetical "*information correct at time of going to print." The parenthetical is necessary because Canada and the USA are currently out of sync with European Summer Time, which ended on October 26. The U.S. Congress decided that extended Daylight Saving Time would save more energy. That is arguable. I've heard the argument that it doesn't save energy because more light in the evening keeps people outside and driving in cars, instead of heading home and going to bed early. Another parenthetical: (I'm writing this while watching "Are You Being Served AGAIN," so for this reason alone I feel I can speak with some authority on European Summer Time :) ). OK, so we skipped a week in there. Thank you for all your great comments on recent posts. What's new in your Philofaxy lives? Lately a couple of blogs have revived (by linking to) a 2-year-old blog post on Lifehacker.com on the subject of notetaking. So forgive me for jumping on the bandwagon here, but I'd like to call your attention as Philofaxers to the bottom half of the Lifehacker post, which has a list of links to printable note-taking forms, including Dr. Walter Pauk's Cornell note-taking method. Filofaxes come filled with a year's diary and various forms, and the company still sells some refill forms, though not nearly as many as in the pre-PC era. Furthermore, these forms and even Filofax's lined and plain notepaper can be expensive. Since it is the PC era, and desktop printers are readily available, we can print our own forms, even notepaper. Here's another classic blog entry, from PigPog, showing how it costs less to use plain A5 paper in a Filofax rather than large Moleskines. I haven't printed my own forms or notepaper yet, but I'm getting close. (All I've done so far is print information typed into word processing docs on my computer onto Filofax paper.) I'm running low on lined white A5 notepaper, and rather than buying more, I'm thinking about buying a ream of A5 paper and printing my own guidelines, so the Lifehacker blog entry is of particular interest to me. By the way, I really like Dr. Pauk's How to Study in College. It's actually more of a manual for life than a study guide. I've met Dr. Pauk. He wrote books for my parents' educational publishing company (but not about the note taking method; that was already copyrighted by Houghton Mifflin). He and his wife came to stay with our family one summer. TMI alert: They slept in my bed. New to Philofaxy? Introduce yourself! Do you have any suggestions for future posts? Every Friday, we give our readers a chance for free discussion. 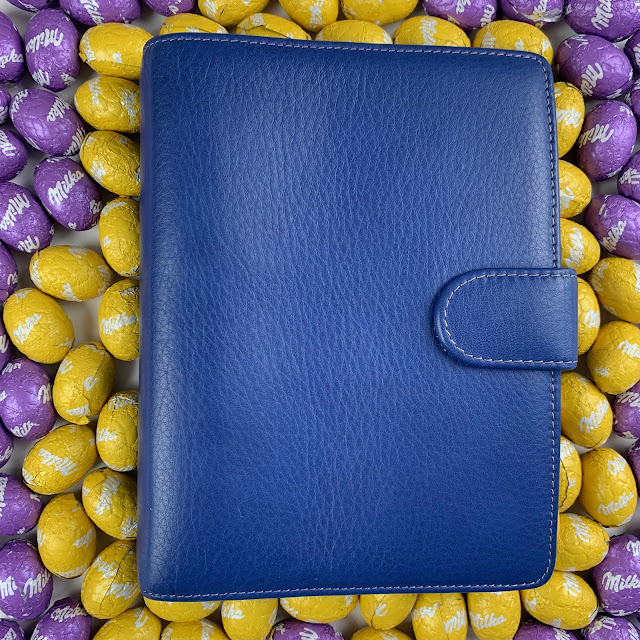 How do you love your Filofax? You may be the next guest blogger! Another fine essay from Laurie Huff, sharing an international perspective from where she's currently living in Albania. I think this is my favorite one yet! This Italian diary is an interesting glimpse into some aspects of Italian culture. One feature is that every day has a corresponding saint. For example, the saint for today is Saint Luigi Gonzaga, whoever that is. Of course that is in Italian, so I might recognize the name if it were in English. The saint on my birthday is Saint Edoardo (Saint Edward I'm assuming). I think this is a pretty neat feature, and I can picture people celebrating their town's patron saint, or whichever saint has particular meaning for them. There is a page for every work day. Saturday and Sunday are together on one page, Saturday at the top half and Sunday on the bottom half. Work days have the time printed on the lines from 8 to 20 (8am to 8pm). And interestingly, days during the week that are a holiday get a little less than a half page rather than their own full page. Which seems like it would screw up the layout for the weekends but somehow does not. And for much of August, regular weekdays have only a half page each. Which is telling because apparently most things shut down in Italy during August because that is when most people go on vacation. It is interesting to me the sense of national identity that can be drawn from using a book like this. Holidays, vacations, festival days and the geography of the country are all here. By following the dates in this book I feel like I have tapped into the national happenings. I can imagine people in Italy having a certain sense of synchronization with everyone else, aware of when things are happening. I own day per page diary books from two other countries where I have lived, Russia and Nepal, and they also give a glimpse into local culture. For example, in the front of the Russian diary along with conversion charts and the zodiac signs, there is a chart for a person's weight and alcohol intake, and the number of hours it takes to metabolize the alcohol and become sober (and safe to drive, since Russia has a zero-tolerance drunk-driving law). For some reason I feel more connected to the people around me when I look at the same information in my diary as they are looking at in theirs. I wish I knew people here well enough to ask to look through their book and see what they have written there. The joining of personal identity within the framework of the national identity. Hey, I think I just came up with an idea for a PhD thesis! Everybody, The Daily Planner is offering good discounts on lots of different Filofaxes, mostly Minis and Slimlines, but other sizes, too. 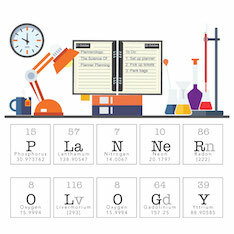 Here's a direct link to the on-sale planners: http://tinyurl.com/3qncq2. 2008 dated refills are also on sale. Just navigate to the usual refill page for your size. A few years ago, I got a "free" Trish McEvoy makeover and makeup lesson, in exchange for which I had to spend a certain amount of money on products. As a planner fiend, I bought this case and a single lipstick to meet the requirement. Trish McEvoy's philosophy "stay simple, stay organized." And indeed, the makeup lesson was based on simple, yet effective techniques for applying eyeshadow colors, blush, and so on. Mnemonics were used to help you remember the shapes and hand motions to use when applying the makeup at home -- "windshield wiper" technique, for example. Her makeup cases have rings like a planner, and she sells makeup colors in the form of "pages" that fit on the rings. Shu Uemura is another designer who is now using a ring-binder format. At the end of the makeup lesson, I was given a sheet to remind me how to put the makeup on. It had a picture of a woman's face with the makeup on it, and the names of all the products to use. I'd probably still be using it today if the sheet weren't a jumbo 8.5 x 11!!! It didn't fit in the case! Cards, Trish, cards! My previous post may give you some ideas this week. Think outside the ... binder? I don't think I've ever done a "random musings" post on this blog. Either I have a concrete idea to develop, or I don't write at all. But with the new Free-for-all Fridays, it would look really bad if I went from Friday to Friday without a post. So although I thought I had nothing to write about...I realize I do. Just nothing completely organized. I can promise that I do have a new post coming, and when. It will be this Sunday, and it will be about makeup kits in organizer form. Something for the girls (and some of the guys). If I'm not posting frequently, it's because I'm not currently in Filofax angst. When everything's going smoothly, there's less to write about. I'm happily keeping all the information I need on Personal and A5 pages. And, to be honest, Filofaxes are a fairly limited subject. For a blog like, say, Notebookism, there are lots of different kinds of notebooks to write about. Filofaxes are a smaller subject, and they work so well, there's not always much to discuss. - Everybody, please check out Richard's comment about his beautiful Slimline Filofax and how much it enhances his life. - I can post about how I label my tabs with a Brother labelmaker. - The A5 binders from Empire Imports in the U.S., or how I might just repunch my A5 pages like standard U.S. 3-ring 5.25 x 8.5 pages. - The running list I keep of things to look up on the Web, so I can just jot things down and get back to work. - What's going on with Franklin Covey, Day Runner, and DayTimer, anyway? No reason not to write about these other systems. - Should we have contests and polls on Philofaxy? Giveaways to drum up more interest? - Should we have more guest blogs? - More holiday-related posts? For example, in the Filofax's front matter, it states that summer is from the vernal solstice to the vernal equinox. But it doesn't say when that is. It took my husband -- a non-Filofax user -- to explain to me that the empty circle on June 18 signified a full moon, and thus the vernal solstice. Should Filofax do a better job clarifying the lunar cycles and seasons on the diary pages? - Should we branch out more and discuss which pens, pencils, sticky notes, papers, and other accessories work with Filofaxes? Is being too purist limiting this blog's activity? This week, a propos of my June 11 post, a reader suggested weighing in on what types of calendars are available in different countries. For instance, the vertical week format is available in the Personal size in France. In other countries, it's only available in larger sizes. What day does the week start in your country - Sunday or Monday? When does your Filofax indicate your workday should begin and end? One of the wonderful things about Filofax is the variety of yearly calendars (diaries to you Brits). Everything from one day to a page, to one week to a page, to one year on one large fold-out sheet. You can see your time in as much or as little detail as you need. You can implement any time management solution with the right format. Or if you're like me, you switch. For example, for my work Filo, this year alone I've tried using one-day-per-page, one-week-per-2-pages (vertical format, as pictured here; the one that usually comes with the A5), and one-week-per-2-pages in horizontal format, just like what comes with Personal organizers, but larger, for the A5. Since my work revolves around deadlines and tasks, not appointments, the horizontal format seemed to be the perfect solution. The vertical didn't give me enough room to write per day, and the day-per-page didn't let me see enough time at once. Well, it seemed to be the perfect solution, until I read about time-striping on the Lifehacks blog, which should sound familiar to many of you reading this blog. Here's a link to Lifehacks' time-striping article: http://tinyurl.com/5jp2cp (complete with a really helpful illustration). It kind of reminds me of a school schedule: First period (hour) of the day: Subject 1. Second period: Subject 2, except the "subjects" become projects. Recently, with a greater number of projects to juggle, I need a solution like time-striping to keep me from jumping from one task to another and taking 2-3 tries to complete any single task. I need a set amount of time blocked off to immerse myself in one subject and nothing else. And I think I'm going to be switching back again to my vertical-format pages—with stripes drawn across them this time. A recent commenter, Kerowyn (thank you! ), had a suggestion that confirmed something I've been thinking about for a while: Do a weekly open post, giving our readers the chance to speak out. With apologies to the Notebookism blog, which is perhaps the most popular implementer of this concept, I've decided to give all of you a forum for your Filofax-related thoughts and feelings. Memorial Day is an American holiday, one of the few days that most Americans don't have to go to work (although those in the retail and restaurant industries have to work, but get higher pay). The TV news carries images of soldiers paying Taps, which I think are heart-wrenching no matter what side of the political spectrum you're on. Local neighborhoods often have parades. Americans are also expected to place flowers on graves that they've neglected throughout the year. Was today an important day in your culture? What did you do in rememberance? Sung to the tune of "Anticipation," of course. This is the time of year, when the new 18-month Moleskine diaries come out, that I'm tempted to stock up before they sell out, in case I have a change of heart later this year. In fact, in 2007, I bought 1 large and 2 pocket Moleskine diaries, in various weekly/daily configurations. It was my first full year of using Filofax, and it was important to me to have the Moleskines there for me in case of emergency, despite the expense. I didn't end up using them at all. These days, I think using Moleskines sounds more difficult and tedious than using the loose-leaf Filofax, but I'm still tempted by the likes of this, from the excellent Moleskine supplier, Ship the Web: http://tinyurl.com/6fmua5. This year, anyway, at the risk of getting set in my Filofax ways, I think I'll resist. A reader recently asked me about the capacity of the Slimline Filofax -- the same paper size as Personal but with a smaller ring size (7/16") for a thinner, flatter shape. I've never used a Slimline -- I don't think I've ever bought a smaller ring size of anything! Has anyone who has used a Slimline fill us in (sorry) on his or her experience? Did you come up with any tricks to deal with the reduced capacity, or did you find it simply inadequate for a daily organizer? How many leaves does it hold compared to the usual Personal 7/8" rings? Does it come with tabs? My recent order from The Daily Planner contained an interesting mix of leaves made in the UK and newer ones made in China. As I write this, world conditions are changing, and increased Chinese wages and petroleum/shipping costs may eventually make Chinese manufacture less economically advantageous than it has been in the early 21st century. But until then, UK-made leaves are a precious find to many of us Philofaxers. Two of the items I ordered—pink lined paper and Cotton Cream to-do pages—were made in the UK. The pink leaves are marked ©1996, and the back of the package is marked "Made in England." This pink paper is both thinner and smoother than Chinese-made pink Filofax paper, which to me means that the English one is higher quality. The Cotton Cream leaves were a mistake on my part—I clicked the wrong item. My everyday Personal Filo is red leather, and I prefer white leaves for my diary and to-do pages. But I've decided to keep the Cotton Cream ones. I want to experience using them. Also, if Cotton Cream is no longer being made, I want to have them. These leaves are marked ©2003, and the package reads "Made in the UK." I love the fact that it also says, "Manufactured by environmentally friendly paper mill." Does anyone know whether the Cotton Cream paper is still being made in the UK? Recently, I ordered a bunch of refills from The Daily Planner. Along with the things I really needed (To Do pages in both A5 and Personal formats), I ordered several items I didn't need. Why? I wanted to experiment with Filofax products I'd never used before to round out my experience and collection, and to report to all of you on this blog. Today I'll start with an insert called "Erasable Marker Memo" on the Web site and on the invoice, and "Most Used Telephone Numbers" on the package. It's a single sheet of plastic, about the same weight and flexibility as a dishwashing-liquid bottle. In other words, quite a bit thicker and stiffer than paper. The insert is ©1995, and the packaging seems to be from the same era. (The more recent packaging is mostly white with only a little dark blue.) Also, it was made in the UK, which makes it a rare find these days. The front of the form reads "Most Used Telephone Numbers" (as shown), and the back says "Messages," with just a page of blank lines below. The instructions read, "Write in pencil or non-permanent marker. Erase with rubber eraser or damp cloth." Just testing it briefly, pencil marks look lighter than on paper, and erase easily. Marker also appeared fainter, and rubbed off easily with just a finger -- no water needed! That leads me to believe just as I suspected -- that marker would smudge more easily than pencil. I would love to use a form like this as a To-Do list for ad-hoc tasks, or capturing temporary notes. But it would also be great for its intended purpose, since the numbers we call most often change from time to time, as family and friends' phone numbers (or relationships) change from time to time. I just placed an order for Filofax refills with The Daily Planner. For my work A5, I ordered a horizontal format week-per-two-pages. Since these are 2008 calendars and we're well into 2008 now, The Daily Planner has them on sale now. My work life is driven by deadlines, reminders, and occasional appointments, rather than constant appointments every day, the horizontal format, rather than the vertical format that comes standard with the A5 filo, is better for me. More on that in a later post. I also ordered 1/5" grid paper that I use for my food journal, and everyday items like ruled paper and To Do pages. I ordered a couple of items -- Personal Computer Paper (3 Personal pages to one 8.5 x 11 inch sheet) and an erasable single sheet ($6) -- that I wouldn't normally order. All in the line of duty. I'll report on how well these items worked for me. As a Filofax blogger, I feel it's incumbent upon me to test these items. I didn't bite the bullet and buy the $50 A5 hole punch -- more on that later. But I ordered almost $90 worth of Filofax paper. I'll let you know how it goes. I like to frequent a local restaurant because it has delicious, freshly prepared appetizers and I can usually get a seat at the bar in front of a TV where I can satisfy my obsessions with CNN, Law & Order, and the Red Sox. The restaurant has a satellite TV system whose channel numbers are completely different from our cable TV channels at home. If you've read this far, you can probably see where I'm going with this. Yes, I have a page in my Personal Filofax, behind the Lists tab and in alphabetical order by the name of the restaurant, with the numbers for my favorite channels on the bar TV. So, I got there the other night, and another solitarily dining woman was watching public TV and had taken dibs on the remote. When she was getting ready to leave, she offered me the opportunity to change the channel, and said she was looking for CNN. I whipped out my Filo and gave her the channel number. She was grateful, but gave me a seriously funny look. In the end, she and I had a lovely conversation and made a good connection. I find that pulling out my Filo frequently turns out to be a conversation starter, usually beginning with someone remarking, "my, what a long to-do list you have." I'd appreciate hearing, in the comments, if anyone else has experienced this phenomenon. And of course, feel free to tell me what a sick puppy I am for using my Filo to keep track of my favorite TV channels at the bar. Some Philofaxers are into taking pictures of what's in their bags; i.e. pocketbook, briefcase, backpack, messenger bag, or whatever bag we carry through our day. I've been promising for a while to do my own. 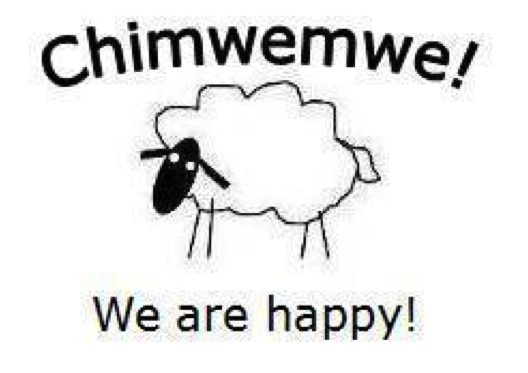 And now I have. Please add yours to the Philofaxy pool! What brought up this topic today? I found my local supermarket now carries the K-cups! As I raised my eyes to see them on the top shelf, I swear the heavens opened with a Hallelujah! Which means I get to throw away this page! As the ringleader of a Filofax blog, I'm chagrined to admit what I'm about to admit. You see, I work in an office where we take turns bringing in bagels for the group every Monday. This week was my week to buy the bagels. One would think that a big post-it note in my personal Filo saying "Bagels Monday," and an inscription in my work Filo saying "My Bagel Week" would be enough. It wasn't. I showed up at work this morning unbageled, and one of my coworkers had already gone out to get them in my stead. It just goes to prove yet again that Filofaxes don't help us if we don't look at them. Usually, if there's something I need to remember 1st thing in the morning, I'll leave my Personal Filofax open to it on my night table, with my glasses hooked into the Filofax's rings, to ensure that I don't start my day until I've been reminded of what I need to be reminded of. (I'm not a morning person, OK?) I didn't do that this time, and it showed. On the bright side, I did remember to get my taxes done. In previous years, there was a wider variety of preprinted Filofax refills. Project and Meeting planners, Shopping list forms, and more. There was probably an exercise planner, too. I'm not sure about Filofax, actually, but Franklin Covey was great for stuff like that. Now that fewer people are buying these paper products, companies have stopped printing these forms. We're expected to use our home computers to print our own forms, using software provided by Franklin Covey or homegrown solutions like those found at DIY Planner. I'm becoming a regular exerciser, and I need a way to record the name of exercise or machine used, minutes spent or sets/reps of each exercise. Spaces for heart rate and calories burned would be good, too. Not for each exercise, but perhaps for the entire session. My trainer is going to take me to a gym and show me a routine soon, and I need a way to write down what I'm supposed to do on each machine so I can remember it, and so I can create a record of the exercise I do on my own. There isn't anything quite like this at DIY Planner, although the site has an incredible array of forms for tracking Weight Watchers points and special health conditions like diabetes and migraine headaches. There's even a Meditation form! People have done a lot of work designing these forms. Unfortunately, there doesn't seem to be something devoted solely to exercise and activity. Furthermore, DIY Planner devotees mostly seem to be using 8.5 x 11, 5.25 x 8.5, or 3 x 5 (index card) sized formats. If you use a Personal Filofax size (3.25 x 6.75 inch), you've got a lot of tweaking to do. Has anyone figured out a good way to track exercise in a Filo? Realistically, I will probably create my own Personal forms using lined or grid Filofax paper and a ruler. But I'd love to see what anyone else is having success with! 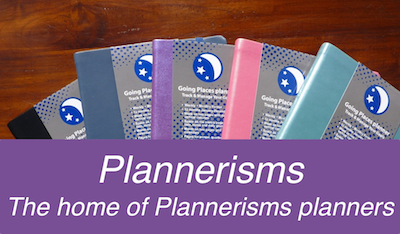 In a recent comment, our reader Dewanna Walser turned us on to a new source of six-ring agendas compatible with the Filofax Personal size - PerAnnum.com. In Dewanna's words, these organizers are "handcrafted here in the USA (rare these days) and the quality is exceptional! You won't be disappointed. The only thing is that all colors and finishes are not always available at the same time -- some are made as they are ordered and may take an additional four weeks." The organizers and other accessories (photo albums, checkbook covers, and so on) are made from Italian leather. Thanks, Dewanna, for the great find. Who knew? We're very pleased to post this followup to the guest blog A5 Quandry. So many of us are using A5 (5.8 x 8.3 in.) size Filofaxes, we're sure many of you can relate to Laurie Huff's words. Congratulations on the green A5 Finsbury, Laurie! It's a beautiful organizer! So to update everyone on my A5 quandary: I wound up getting the A5 Finsbury in green. I really like it. The color is nice, and the ring size is great. There is plenty of room for me to stick in all of my stuff. And I LOVE the calendar layout. It will be great when I am really busy and have a lot of things to schedule. But, but… by the time I received my A5, I no longer needed it! I ordered it at an extremely busy time in my life, and by the time I got it (a month later, when I got back to the US) the busy time was over. It seems to be "too much planner" for me right now. I moved all of my info over into it anyway, because I was excited about it. Then I tried carrying it around in my purse for a couple of weeks. It is just too big to drag around with me everywhere every day. So it sits on my desk. Which is perfect when I am at home. But to be honest, if I have to carry something around with me everywhere I would rather carry my black Personal size Filo. Which sends me right back to my original problem: the Personal size calendar doesn't give me enough room to write when things get busy. I'm thinking of using my day-per-page dated Moleskine (which I am currently successfully using as a journal) as my calendar, and my Personal sized Filo as my reference/ address/ information book. During the busiest week last month I was using my Moleskine as my planner and journal, with my appointments and to-dos in a narrow column on the left side of the page and the rest of the page open for journal-writing for that day. I was pretty happy with that. At the moment my life has slowed down so much that I hardly need a calendar at all, which is a strange situation for me to be in. But in a couple of months I will be preparing for yet another move overseas (long story!) so I think at that time I will begin to appreciate the planning power of the A5 size. We'll see. For now I have just about every calendar permutation I could possibly need: A5, Personal size, and page per day. Every time my life changes, my planner needs change too. With these 3 types at my disposal, I can use whatever works for me at the time. In the meantime I'm trying to just go with the flow! I've detached myself from the FLYlady pod, and outfitted my Routines tab with sheets I made according to my own system. In the past, this system has worked better for me than FLYlady; although I've kept my FLYlady morning and evening routines in place. In my system, I separate things into weekly, monthly, semiannual, and annual tasks. I've made a page for each, with a place to initial for the date completed. I've provided an illustration, since that's the best way to see how it works. I've updated the tabs on both my Personal and A5 (Household) Filofaxes. Personal: To Do, Projects, Diet, Ideas, Lists, and Tel (no A-Z tabs). Household: Routines, Quickies (things you can do when you have 5 free minutes), Projects, Notes, Appliances, Emergency, followed by A-Z tabs. Well, I found that the extra room didn't do much more than let my handwriting get bigger, and crowd out the pages behind my rear tabs (left). Today I switched back to week-per-2-pages (unruled), and feel good about the decision (right). It only took me about an hour to rewrite 3 months of appointments. I'm going to rewrite the to-dos from the dated pages onto...well, To Do pages, so that I can move the page ahead from week to week. I'm going to use my To Do pages differently, and I'll have to redo my tabs, but that's for another post. I now remember the feeling of week-per-2-page constriction, now that I don't have the extra Notes space, and the weekend days are especially compressed. I now believe that the 2-days-per-page is ideal for someone who has almost nothing in any tabs except the diary (not me), or for someone who has a 7-days-a-week schedule with lots of clients, appointments, or events to track (at this time in my life, anyway, not me either). It's actually very easy to change formats in the middle of a year with a Filo. Just take out all the unused pages in your current diary, and add the new format from there on. No copying necessary. I've done it that way before. In this case, I decided to use the switch as an opportunity for cleanup, so I rewrote. Here I am again, rethinking my Filofax for the millionth time. Now I think I have found my solution. I think it is time to upgrade to the A5. I recently realized why my Personal sized Filo calendar just doesn't work for me. It is not set up the way that my mind works. I visualize the week with the days as columns going across the page. Once I discovered that this is the only way I can effectively remember what I have to do, or even keep track of what day it is, I felt a huge amount of relief. That calendar format does not exist in the Personal size, only in the A5. And even if it did, I would still need the extra writing room afforded by the A5. That debate is over. It's not my Filo's fault that it doesn't work for me. "Don't cry little Filo. It's not you, it's me. Really." But the end of one debate brings on a whole new one. Specifically, which A5 binder will I get? To be honest, none of them really turn me on. I would prefer a dark brown one, but the only A5s to be found in brown are the Kendal (too masculine) and the Classic. My problems with the Classic are that puffy cover, and mostly the small ring size. It only has a 1 inch capacity, which is just too small for me. I like to put lots of things into my binder, so I need all the room I can get. The only A5 binders with a larger ring capacity (at a mere ¼ inch larger) are the Guildford (which comes only in black, again too masculine and definitely too executive-looking for me), and the Finsbury. Okay, so the Finsbury. I like the price, by far the cheapest of the leather A5 binders. I like the larger ring size. But I just can't find a color I like. The pink is too frilly for me. I'm not sure what the green would be like, would I get tired of it? Black is okay, but again a little too masculine. Tangerine is definitely out, that color and I just do not get along. Maybe red, although I never wear anything red and as my husband says, I'm "not a red person." This is an investment for me, and I want a binder I will be able to use and enjoy for years to come. Unfortunately for me I live nowhere near a retailer, so I can't see these in person before I buy online. I will be using this for personal, home, projects, travel etc. I prefer to have everything in one binder. Which is why I'm concerned the 1 inch rings might not work for me. I can't decide if I should get the chocolate Classic and cram it full, or if I should settle on a Finsbury color I can live with. I just want to thank everyone who answered our recent poll on "How do you Filo?" I urge everyone with an interest in Filofaxes to read the responses. The responses prove that there are as many unique ways to use a Philofax as there are people. At the same time, there are some things in common. Most of us have used another ring-bound system -- like Day Runner or DayTimer -- in the past. Many (myself included) have also used an electronic organizer. But we've all come back to Filofax, and somehow it feels like coming home. This week, at a reader's suggestion, I'm trying something new -- a Roll Call! - How long have you been using Filofax? - What size(s)/model(s) do you use? - What's behind your tabs? 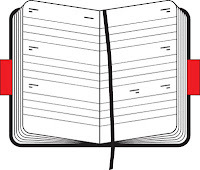 - Have been using Filofax, or DayRunner, or FranklinCovey on and off since the mid-80's. - A Black A5 Finsbury for work, a Red Personal Finsbury for personal, and another A5 for household. - Mostly, the week-per-2-pages, horizontal format. My least favorite is the vertical format week-per-2-pages, although that's what I'm using in my work A5 now; it's the easiest to get for A5. In my Personal, I'm experimenting with 2-days per page, and I think my dream format would be 2-days per page in A5! - I've talked about my tabs frequently in my posts, but I'll sum it up here. In my Personal, I have Projects, Maybe, Ideas, Lists, Life (my code for health and fitness), and Tel. In my work A5, I have a tab for each of 3 major projects, plus To Do, Projects, and Notes, plus I use the A-Z tabs for contacts and reference info. I've just been away for a week, in a place where I, surprisingly, didn't have much Internet access. That's why there were no new posts last week. But I sincerely appreciate all of the recent comments -- check out the previous post if you haven't read them! One of our readers asked me to explain how I use my household Filofax, so I'll report on that now. It's an A5 Filo, with a week-per-2-pages calendar. I prefer the horizontal format for this book, but all my local store had was vertical. Basically, the book is supposed to be a Filofax version of the Flylady "Control Journal," but it's still a work-in-progress. On the calendar pages, I record each day's routine tasks (:15 paperwork, :15 decluttering, and so on), as well as both my husband's and my appointments, and the dinner menu. I update it once a week, on Sunday. The rest of the book is supposed to hold emergency numbers and other contact info, evacuation instructions, and so on. Flylady.net has instructions for preparing all of this, but I just haven't done it yet. And most nights, do I collapse into bed before doing all of the day's tasks?